Hello friends! Here we are another week down. Another week closer to summer. It has been oddly chilly, cool and gray here lately, and we have rain in the forecast for the next 4 days. I suppose the good thing about it is that, so far, we have no mosquitoes. But, it doesn't quite feel like May to me. I am dying to shoot at the beach. I had a family session scheduled this week at the beach, but we had to move it up to this morning before the rain hits, and shoot at a park since it is too windy and cool at the ocean. Fortunately, the rain held off and all went well. Maybe next week we can hit the beach. 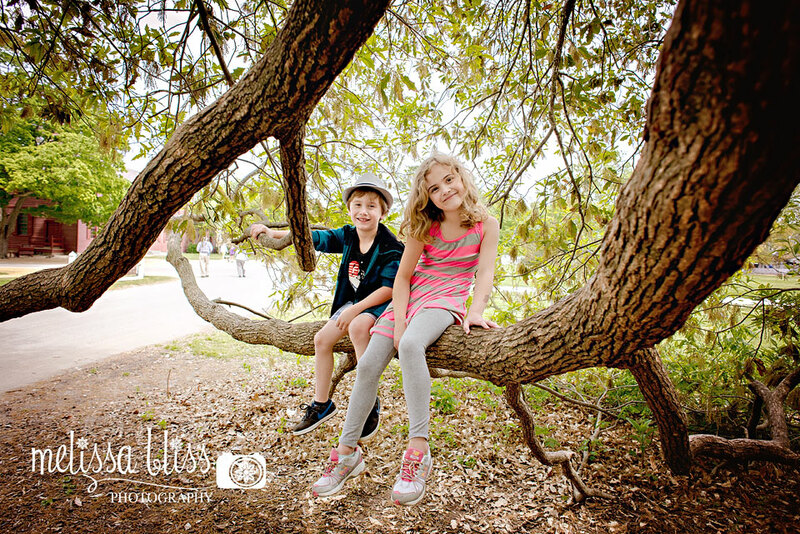 I am sharing a shot today of my middles in a tree. Tree climbing seems to be a favorite pass-time lately. I hope you all had a great weekend! How did you spend it? How perfect is that u-shaped branch for climbing and posing?! oh I love that shot! So cute! What a great tree. Awesome perspective on this one Melissa. I have been DYING to do some photos at the beach. Can you believe I have not been home to the beaches of So Cal since about a year before I bought my camera. It needs to capture the beach. What a wonderful photograph this is, Melissa. That's a great tree branch! I hope things warm up for you and me soon. This weather is nuts. It's hard to shoot outside when everything is a muddy mess. I've been enjoying all our Facebook photo shares. Gorgeous work! Love this! What a perfect branch for photos!! Sorry about your weather ... unfortunately i think it moved up this way. :( the beautiful sunny 70-degree weather we enjoyed for a week looks like it won't be around for a few days. i'm looking forward to seeing some beach photos from you!! Oh...such a perfect place for photography my friend!! i would of been jumping up and down...smile! Great photo. P52 - Week 21- Happy Memorial Day!